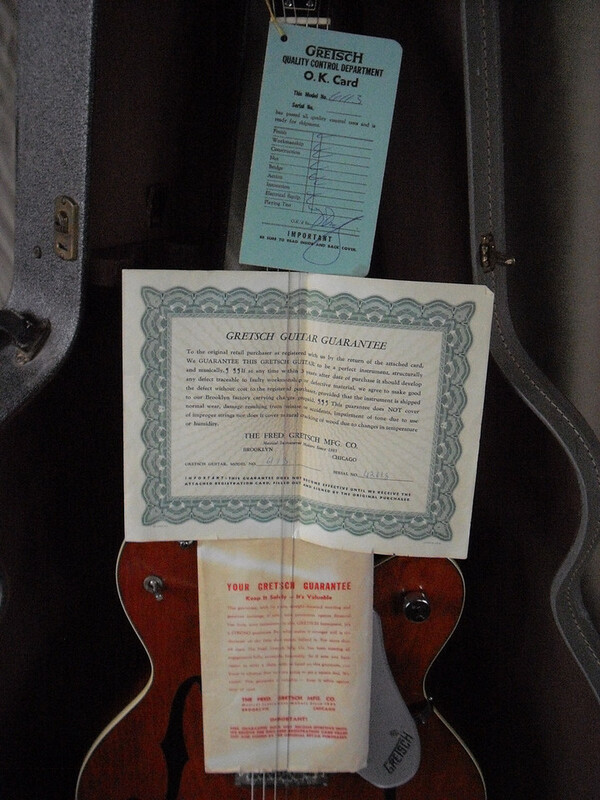 Odd adjustable bridge Gretsch experimented with at the time but never officially offered, according to Dan Duffy. I breifly owned this guitar. Here is some of my eBay description from when I sold it in 2012. 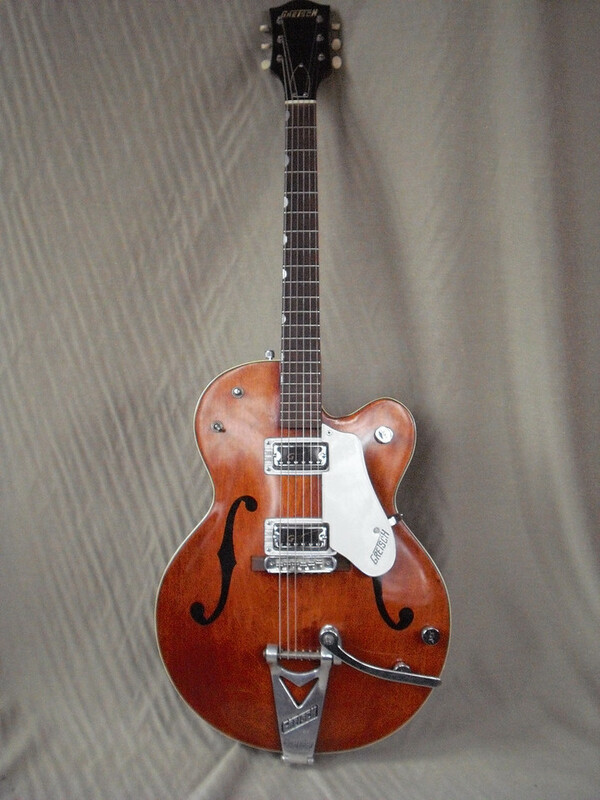 Gretsch introducced the Chet Atkins 6119 Tennessean in 1958. The original incarnation was a deep bodied, open f-hole red guitar with a single FilterTron in the bridge position. 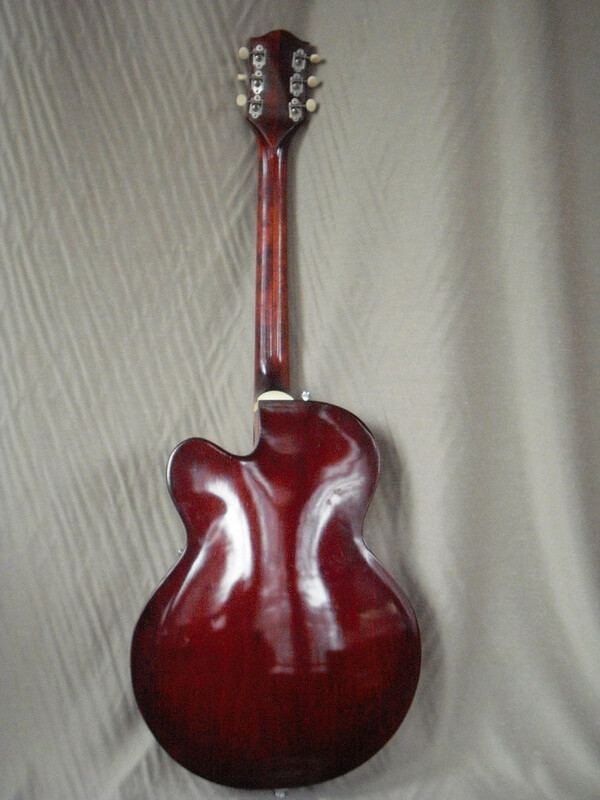 That version underwent some minor changes until mid-1961, when it was completely redesigned to feature a thinner sealed “ElectroTone” body, painted f-holes, a burgundy finish, and dual HiloTron pickups - a model later made quite famous by George Harrison and many other guitarist of the mid 60’s. Well, as it turns out, the story isn’t quite so simple after all. Gretsch didn’t simply redesign the 6119 in 1961. Instead, they introduced a completely new model, the 6113, and only later decided to once again call it a Chet Atkins Tennessean 6119. And that’s what this guitar is, a 6113. Dan Duffy had this to say about the guitar - “The 6113 was a take off on the 6119. Chet got passed off because of the royalty and the mod 6113 had a short life if any at all…All that I can tell you about this guitar is that very few were made.It was dead before it started. This could be one of only TWO. I only remember it because of the controversy.” From Mr. Duffy’s comments, it would appear that the Chet Atkins 6119 was dropped in 1961 and the 6113 introduced as a non-signature model in its place. Evidently Chet didn’t much care for losing out on royalties and a kerfuffle ensued, resulting in the short lived 6113 being renamed 6119 and getting a Chet Atkins signature on the pickguard. I should note that a few examples have turned up, so it seems that more than one or two were made. And regarding the unusual bridge, Mr. Duffy had this to say - “As far as the bridge goes I think it came from The Fred Gretsch Guitar Assessory Dept. on the 7th floor of the building.From the inception of the Spacer Bridge I was always trying to find a bridge that would adjust the intonation as well as the spacing of each string. Notice that this bridge does that.These bridges always wind up looking very ugly. I remember the bridge and we did not make it.” While I have to agree that it’s not as streamlined looking as a bar bridge, “very ugly” may be going a little far. I think it has more of a Melita-esque contraption look to it, which is kind of cool. You do see these turn up on early 60’s Gretsches occasionally. After seeing enough of them, I started to think they might be an original that Gretsch occasionally used and it’s nice to hear Mr. Duffy confirm that.